Orbital ATK's Cygnus spacecraft arrives at the horizontal integration facility at NASA's Wallops Flight Facility on Oct. 2 to join the Antares rocket. Cygnus is scheduled to launch on the Antares rocket at 8:03 p.m. EDT, Oct. 16, 2016, carrying about 5,100 lbs. (2,300 kilograms) of cargo to the International Space Station. A cargo-supply mission scheduled to blast off to the International Space Station from NASA's Wallops Flight Facility in Virginia this Friday will happen no sooner than Sunday (Oct. 16) as Hurricane Nicole marches straight toward the rocket's tracking site in Bermuda. NASA and Orbital ATK, a private spaceflight company contracted by NASA to fly unmanned resupply missions to the space station, currently have until Oct. 19 to try and launch Antares, and are working to extend the window, NASA spokesman Keith Koehler of Wallops Flight Facility told Space.com in an email. If they stick with the Sunday launch date, Antares is scheduled to lift off at 8:03 p.m. EDT (0003 Oct. 17), with a 5-minute launch window. On Oct. 10 at 10:55 a.m. EDT, NASA's Terra satellite saw a concentration of powerful thunderstorms circling Nicole's center that appeared a brighter white than those storms surrounding the center. "The tracking station at Bermuda is required to conduct the Antares launch from Wallops," Steven Kremer, chief of the Wallops Range and Mission Management Office, said in a statement. "The ability to support a launch will depend on the impact the storm has on not only our systems, but also the overall Bermuda infrastructure." 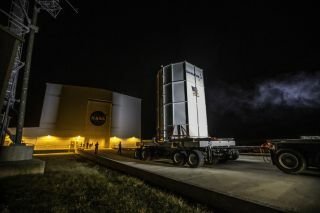 This particular resupply mission launch has faced several delays since its original target launch date in July, but previous delays were not weather-related. The upcoming launch will be the first time that Orbital ATK's Antares rocket will fly to the space station since a catastrophic explosion during an attempted launch in 2014. NASA TV will broadcast live footage of the launch, and pre-launch broadcasts will begin on Saturday (Oct. 15) at 4 p.m. EDT if the Sunday launch date remains unchanged.